Draw It is a book on tips and techniques for sketching. The chapters are divided according to the different tools used such as the pencil, pen, brush pen, marker, pastel and watercolour. The pages are coloured coded to the different drawing tools so that you can source them out easily. Highlight of the book to me are the beautiful sketches included. Author Lynn Craig is a professor who teaches freehand drawing at the School of Architecture at Clemson University. Most sketches are of buildings and scenes but there is also a good amount of sketches with people in them. I love the pencil and pen sketches. They really portray the form of the subjects well, whether buildings or people. The drawing tips and techniques are laid out to the sides and bottom of the sketches. As the book is quite small, about A5 size, and most of the pages are filled with artworks, the space left for the writeup is quite small. The tips are helpful but sometimes I wish there could be more. For example, for perspective, only one-point perspective is included and not two or three point. Another downside of the book is the binding which I find to be too stiff. It takes more energy to hold the pages open, relatively speaking. Overall, I find the book to be inspiring especially because of the pen and pencil sketches that I like. There are useful tips and techniques even if they are a bit short. 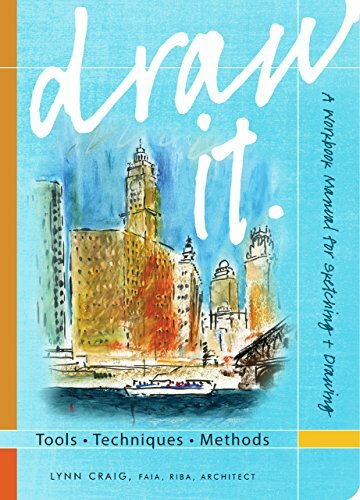 This is not meant to be a comprehensive book on sketching, but it does offer inspiration. Those who like sketching should check it out.